Honey, Anahera and Sista B (NRG Girls) and the band led by our very own Brother Truce on bass, and bringing home TNT Trinity on drum, Selz and Lloyd on keys, and Damian Porima on guitar are pleased to bring you their new album and after 7 years waiting since the release of From Darkness To Light they are super excited to share this memorable time with you. That is whats up right there - NRG is so blessed to be surrounded by such inspirational artists and humans. Thank you all so much this is going to be a big night. We look forward to seeing you all on this very special occasion. 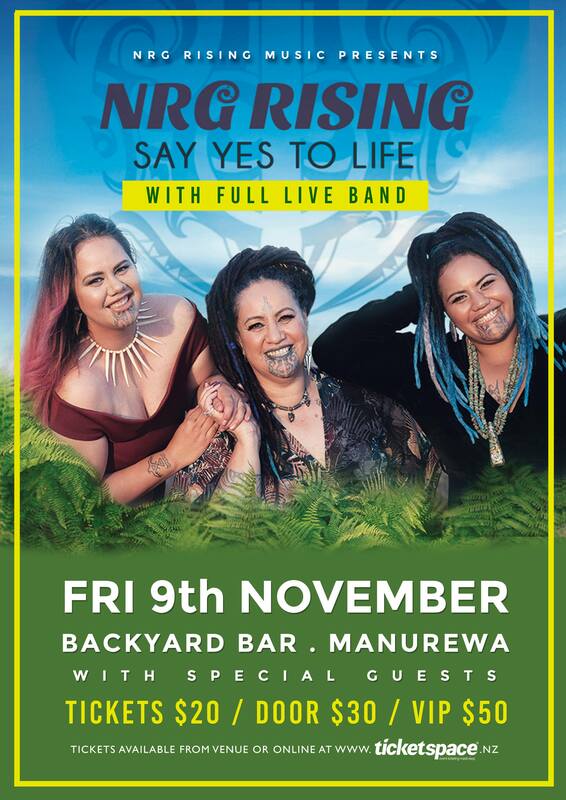 There is reggae music Aotearoa but there is only one NRG Rising - female native reggae group representing our beautiful Aotearoa both here at home and overseas sharing story time and music with indigenous nations and bringing you a live experience like no other reggae band can. Thank you for being their for us all these years, we appreciate you and honour you.